Most of us like to have oatmeal for breakfast but sometimes you feel bored eating the same thing again and again. 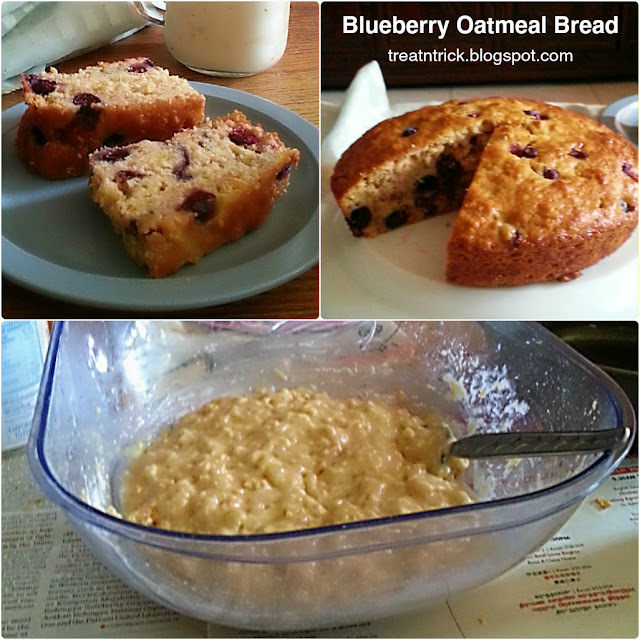 So I incorporated rolled oat and adding fresh blueberries for making this Blueberry Oatmeal Bread. Oatmeal is a healthier choice but tasteless to eat on its own. The benefits of rolled oat can be enjoyed in yeast/quick bread, muffins, breakfast bars, granola, biscuit, pancake, oatmeal burger and crumble. Include this natural power food regularly that contains minerals, vitamins, fiber, lipid and numerous health benefits in your diet. The fiber in oatmeal makes you feel full through out the day. Fiber also eases constipation and control blood sugar. Some packets of instant oatmeal, loaded with sugar as much as 8 tsp per serving and high in sodium. Always check the label to see what you are getting. For healthier choice, replace half of plain flour with wholemeal flour and easily turns it into dairy free by using oil in place of butter also milk with soy milk, almond or rice milk. 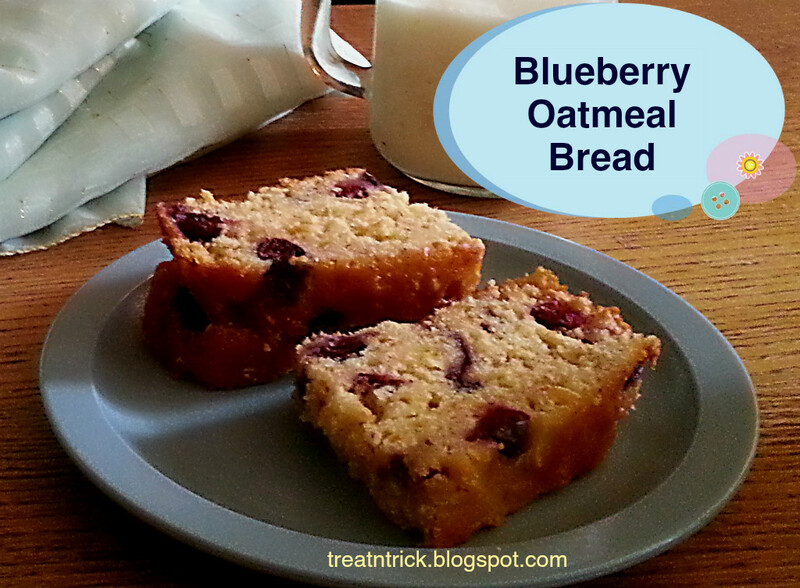 This Blueberry Oatmeal Bread were delicious. Very filling with the oatmeal in them. came out super moist too. Other fabulous recipes made with oatmeal. Click on the title to view full recipe. Preheat oven @ 180 C and grease 8 in cake pan. Wash and drain the fresh blueberries. Toss blueberries with a tablespoon of flour. With a whisk, combine flour, baking powder and baking soda in a bowl. In a separate bowl, beat together milk, butter, essence, egg and sugar. Pour milk mixture into dry ingredients, stir until just combined. Mix in blueberries. Spoon mixture into prepared pan, bake for 40-50 minutes or until a skewer inserted comes out clean. Cool in pan for 15 minutes before transferring onto wire rack to cool. Your recipe looks so delicious! I love oatmeal and blueberries so this would truly work for me. Thank you for sharing it! 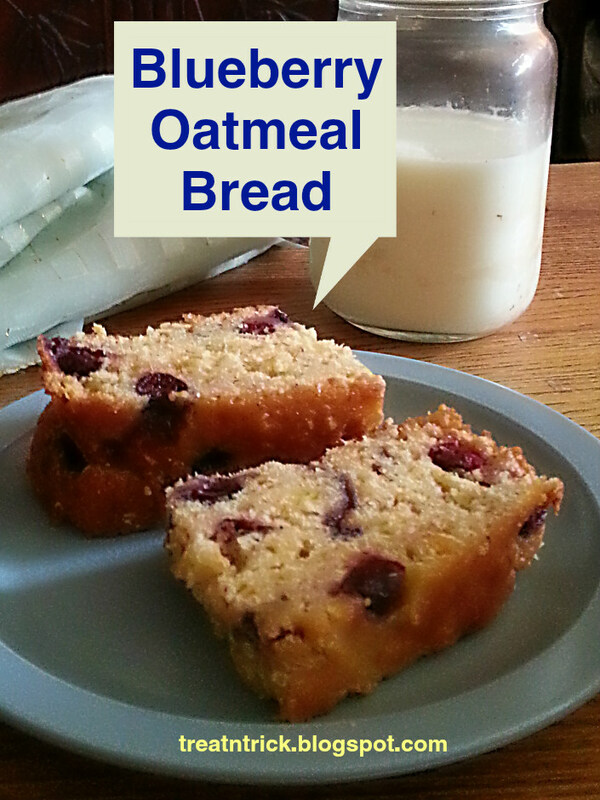 No need to convince me - I looooooooove baking with oats. I saw your recipe yesterday morning and made it for our Easter breakfast - I was short on milk so I used yogurt and subbed in coconut oil for butter - it is marvelous! I'm sure your original recipe is really good, too. I really like the oats in it. This looks like a fantastic recipe. I have pinned it to try this summer during blueberry season. I do have a question - is caster sugar just white sugar, cane sugar, or brown sugar? Yummy! I would love it for breakfast! Sounds absolutely yummy! Thank you for sharing at The Really Crafty Link Party! Pinned! What a delicious fruity bread! Sounds Yummy! Anything with Blueberries make me smile! Thanks for linking up at #MerryMonday! This looks like a really great recipe! Thanks for sharing at the Family Joy Blog Link Party this week. Yum! Looks so good! My whole family loves blueberries, and I love oatmeal, so this is definitely a win-win all around. Thanks for sharing at the #happynowlinkup! Yum this is calling my name. I love quick breads. Okay all breads. Thanks for linking up with us at Family Joy Blog Link Up Party this week! This looks delicious! 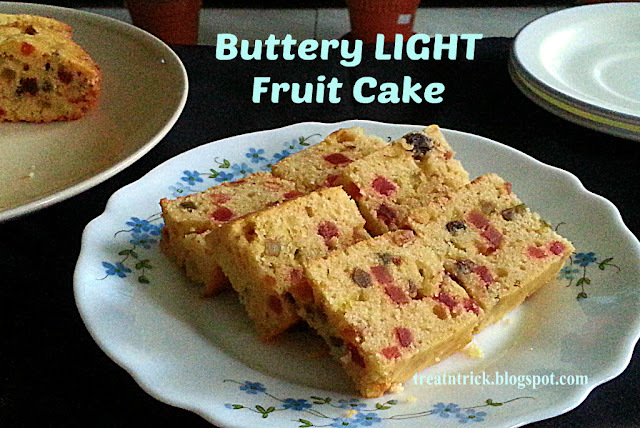 Thanks for sharing it with us on the Creative K kids' tasty Tuesday linky!